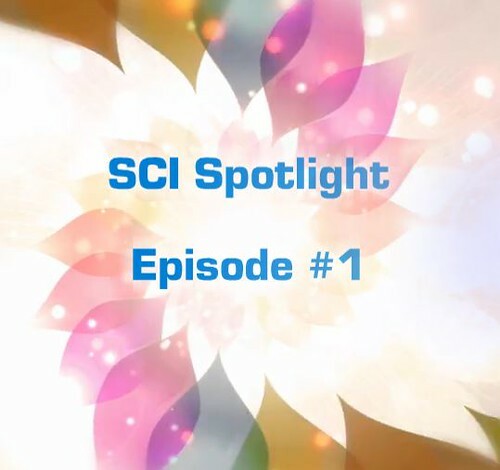 We are thrilled to announce the first slideshow in our NEW SCI Spotlight slideshow series! In our first slideshow (each one is under 1 min), meet Laura Miola (a mom from Italy), Ben Clark of Adapt To Perform, Marco & Mackenzie from Full Radius Dance (an integrated dance company in Atlanta) and Ian Mackay, accessible trail advocate. This entry was posted in Feature stories, SCI Superstars and tagged ben clark adapt to perform, full radius dance, ian mackay, laura miola, slideshow, Spinal cord injury on November 8, 2018 by Tiffiny. A spinal cord injury can take many things away, including physical loves that are no longer possible. For Ian Mackay, the great love in his life was bicycling. He was an avid cycler at the time of his injury, but he did not let his passion completely disappear once he became paralyzed. Instead, he found a new way to enjoy the open road, and he’s been helping thousands of others along the way. With his youthful face, one wouldn’t think Ian Mackay was a few years shy of 40 years old, but growing up in California, and being drawn to bicycling and the outdoors early on surely has helped keep him young-spirited. Once he graduated from high school, he first attended college at Cabrillo College and then the University of California at Santa Cruz. He was studying biology and birds. While bicycling home from classes one day, Ian was in an accident. When Ian was a cyclist, he loved long rides. Post-injury while exploring trails, he would push himself daily to see how far he could go. 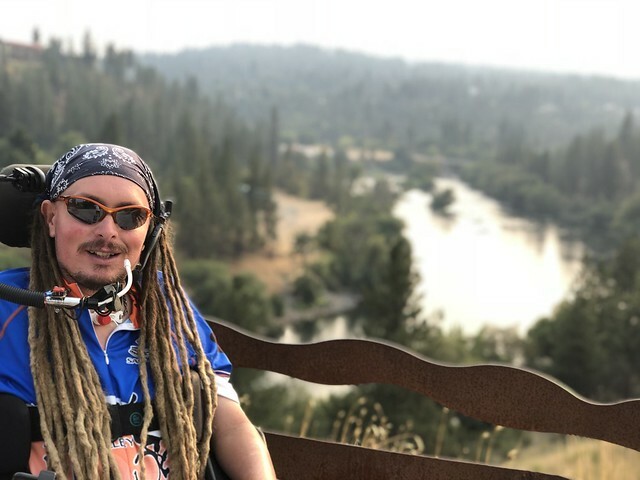 “This was about embracing what I loved before my injury and enjoying it in a new way.” Once he discovered how much joy it could still bring him, he felt motivated to share his love of riding the trails with others with spinal cord injuries, and he did his first “Ian’s Ride” in 2016 when he rode across Washington, driving over 330 miles. Ian did another “Ian’s Ride” this past summer. “The main inspiration for my big ride was threefold,” says Ian. 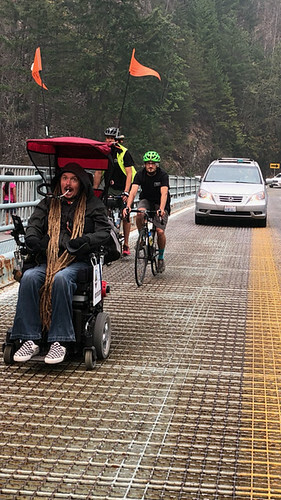 “First, long rides in my power wheelchair are kind of my thing.” “Second, I wanted to advocate for more accessible trails in Washington.” “And my final reason was to encourage others, in chairs, to get outside and not take our beautiful natural environment for granted.” During this 2018 ride, a 13-day trek that crossed Washington, Ian brought friends on bicycles in the front and the back of him to make sure he was protected from passing cars. His team also organized a battery switch out to ensure he could go all day and drive the miles needed. While the cold season is on its way and Ian won’t be doing any more rides until next year (at the earliest), he plans on focusing on his other passion for the next several months – peer support. “There’s a fantastic peer support network in the Pacific Northwest. There are a fair number of high quads in Western Washington and we tend to be quite close and speak on the phone frequently. Having someone to call who has ‘rolled the roll’ and understands the challenges that come with paralysis is invaluable.” We couldn’t agree with Ian more. 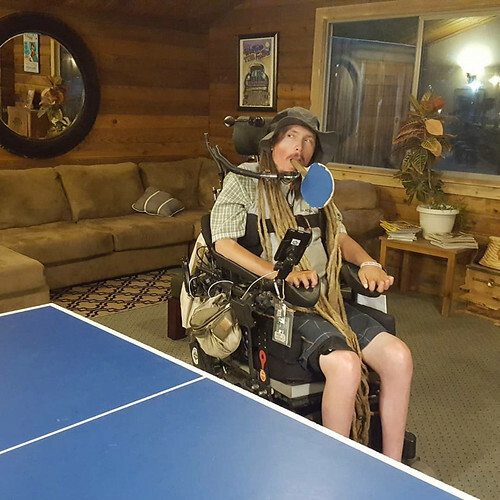 This entry was posted in SCI Superstars and tagged ian mackay, ian's ride, power wheelchair long distance, quadriplegic hiking on October 24, 2018 by Tiffiny.